When you buy a microwave oven you will be faced with a few decisions. Are going to mount it on the wall? Over a stove? Is it going to need to an exhaust fan included for a range below or are you just going to set it on your counter? With all the mounting hardware available today, mounting a microwave has never been easier. Decide where you want to mount your microwave. Check to see if you have power available for plugging it in. If there is a cabinet just above it, it is common to drill a small hole in the bottom of the cabinet and fish the plug up through it to use the plug in the cabinet. Find the studs in the wall. You can do this with an electric stud finder or by using a small trim nail to poke through the wall until you find the wood stud. Mark it with a pencil and find the next one. You need to find at least two studs to mount the weight of a microwave on the wall. Hold the mounting bracket for the microwave against the markings you made for the studs, holding it within the place measured out for the microwave. Check to make sure it is straight with your level. Mark the screw holes with a pencil. If you cannot reach the studs the way the wall bracket sits in your opening, you will have to drill larger holes to use the toggle bolts, instead. Drill four pilot holes where the pencil markings are. You should drill through the wall and into the wooden studs. Screw the mounting plate in place using the pre-drilled holes. The back of the mounting bracket should be flush with the wall. Slide the microwave into the mounting bracket, tilting the front up and the back down so that it slides in place. Some microwaves have a couple more screws that hold the microwave to the bracket. 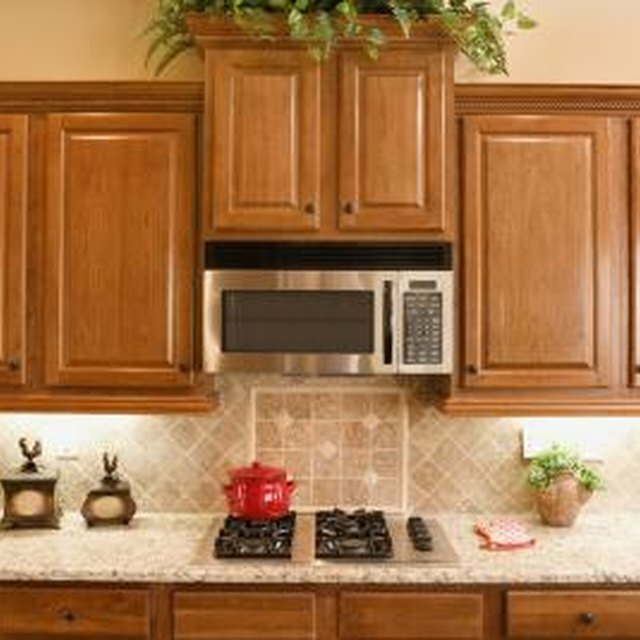 Additional support can be added by bolting the microwave to the cabinet above it.